What is a temperature transmitter? At BM Engineering Supplies we understand the importance of sourcing high quality process instrumentation for measuring, monitoring and controlling essential processes like temperature. In this blog, we explain the functions and benefits of temperature transmitters. A temperature transmitter is an electrical instrument that interfaces a temperature gauge – such as a thermocouple, RTD, or thermistor – to a measurement or control device, such as a PLC, DCS, PC, loop controller, data logger, display or recorder. Typically, temperature transmitters isolate, amplify, filter noise, linearize, and convert the input signal from the sensor then send (transmit) a standardized output signal to the control device. Common electrical output signals used in manufacturing plants are 4-20mA or 0-10V DC ranges. For example, 4mA could represent 0°C and 20mA means 100°C. What are the advantages of temperature and pressure transmitters? Temperature transmitters feature significant advances over their direct wired counterparts. They eliminate special cabling requirements, simplify engineering and maintenance, as well as enabling advanced diagnostics. The disadvantage of temperature transmitters is that they can obviously add extra cost to the temperature measurement system. The ability to include local indication and control. Much greater noise resistance, especially over long distances. Isolate, amplify, filter noise, linearize and convert the input signal from the sensor. Output signal works with many standard devices. Does not require expensive extension wire. 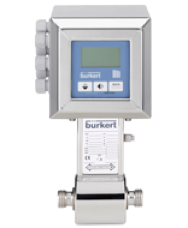 The Bürkert Type 8400 is an intelligent sensor/switch with an extra large display. 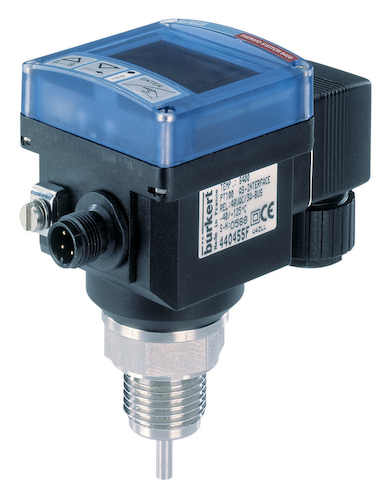 It is specifically designed to switch a valve and to establish a monitoring system or an ON/OFF control loop. Compact and wall versions are available and connections to the process in the piping are made using standard fittings. The switching points can be programmed with the three key pads or optionally, with input 4 – 20 mA, from an external PLC over a 4 – 20 mA loop. Read more here. The switching points can be programmed with the three key pads or optionally, with input 4 – 20 mA, from an external PLC over a 4 – 20 mA loop. As an option, the process value can additionally be transmitted to the PLC (4 – 20 mA). This device also delivers menu-guided parametrisation and complete communication thanks to external setpoints.